Long distance road trips can be expensive, especially in places like Japan where to get any distance in a reasonable amount of time, you have to take tollways. When you add up the cost of hotels and food it can get quite expensive. But there’s a better way: turn your car into a mini-camper! When a friend of mine suggested we do a holiday trip from Tokyo to Nagoya to Lake Biwa to Kyoto and back to Tokyo a couple weeks before the Christmas break, I wasn’t sold. When we discussed renting a mini-Kei car camper, I was even less sold. I’m a big planner, and I don’t like doing things last minute. But then I thought: why rent, when I can build? The first thing you’ll need, obviously, is a hatchback, wagon or crossover/SUV of some kind. Or a truck with a camper bed. If there’s a way to do this with a sedan, you’re welcome to try it, but I’m good. When you go about setting up a camper conversion, the biggest concern is going to be how you’re going to make the interior of the vehicle flat enough to sleep on. Some vehicles have seats the fold down flat enough that just adding a foldable mattress or futon directly onto the flattened seats will be enough to get what you need for a decent night’s sleep. Other vehicles have back seat delete kits you can order. But that’s not cheap, and it’s not do-it-yourself. You want to be cheap and you want to be flexible. In my case, I already removed the back seats and put in a false floor in my post on doubling my hatch space. Now, since making a mini-camper wasn’t my original goal, it’s not quite long enough for someone who is 5'10" like me, but that was okay. The length of two fully insulated hot/cold Costco bags of clothes and camping supplies filled that space between the end of the false floor and the back of the Recaro seats when they were pushed all the way forward. Perfect length. Your next step is going to be what you want to sleep on. Sure, if you’re being really rough about it, and it’s not too cold outside, you could just toss in some sleeping bags, but if you want something much more comfortable, I suggest a foldable mattress or a futon. That’s going to make it approximate the kind of sleeping comfort you could find at home or in a hotel. With the addition of the costco bags, I then had enough space to put in all of my futon mattresses, comforters, and two sleeping bags. Altogether a lot of insulating warmth for sleeping in a non-insulated vehicle in December in Japan. All that easily folded up under the back pillow of an Ikea Solsta and the standard hatch shelf. Leaving enough space to move the Costco bags up to take up the rest of the rear hatch area so my passenger and I had plenty of leg room up front when I was driving. When all folded out the mattresses and comforters should run the length of how you flattened out your interior. Either the folded down seats or the false floor. My bedding did indeed run the length of the floor and the Costco bags, giving perfectly adequate room for two admittedly smaller than average humans. Your height will vary, so you should make sure that you won’t end up scrunched up. For us, the backs of each Recaro could also be positioned in such a way as to allow each of us to sit up and play on computers or tablets, or we could just read. You should also be aware that in order to make this as functional a mini-camper as possible, you’ll want to add some basic amenities. Look for ways to use the interior space not just for sleeping, but for getting work done, being entertained, and cooking. Given our feet were at the hatch end, the hatch shelf was put back in place to allow for two LED puck lights to be placed on either side, and a laptop could be placed in the middle to watch a movie. Indeed, because the GA3 is more height than width compared to the overall bigger EK Civic, it would be possible to actually sit and do work at the laptop or eat a meal on the hatch shelf, which is exactly what you would need in a mini-camper. Two major additions that were planned and ended up not panning out (despite all the pots and pans we actually brought) but that I would recommend is the addition of a 12-volt DC to AC inverter for powering laptops or electric kettles, and definitely get an induction heating surface. That will make sure you have the flexibility to cook on the cheap, especially if you don’t otherwise have access to power outside of your own car battery. High point, Amanohashidate/Kyoto. Kat Callahan/Jalopnik. Mini-camper conversions allow for trip flexibility at times or in places you otherwise wouldn’t have. In Japan, there are a number of public camping spots that are open year-round, although you have to search for them in advance. You are also allowed to park in certain public parking areas near famous scenic spots, and there are “road stations” where you can sleep over night. They’re more like shopping malls on the tollways than “rest stops.” This drastically will cut your hotel bills, and they are relatively safe. This flexibility of vehicle and mobile-sleeping/cooking space means you can go to rare places you can’t otherwise get to, and you can go during times where getting hotel rooms might be difficult. 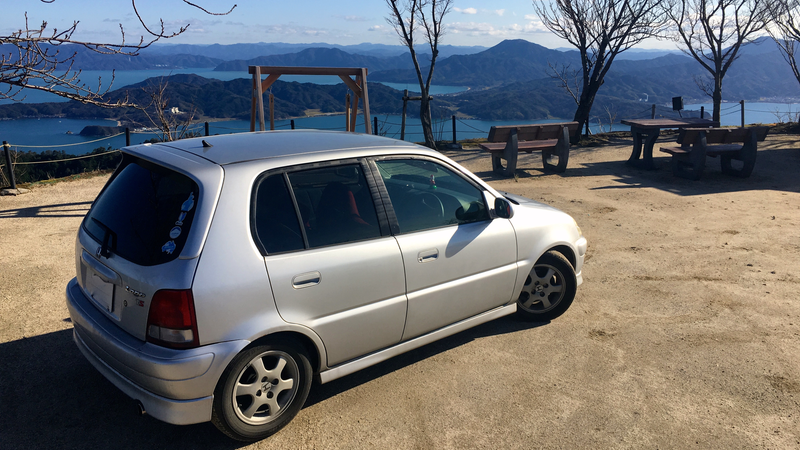 My passenger and I went to Amanohashidate in Kyoto, the name means “Bridge Over Heaven,” which is one of the most scenic spots in Japan, and we went on Christmas. As a resort town, there is no way we could have reserved a hotel room for the holidays in the time we decided to make the trip. That meant that if we had wanted to stay in Amanohashidate, our mini-camper Logo would have been it. Likewise, we had a similar situation at Lake Biwa, the largest fresh water lake in all of Japan. We slept in a public parking spot right on the lake, in the midst of large luxury resort hotels we could neither have afforded nor reserved. And the lake itself wasn’t the only experience we had made possible by our decision to go mini-camper, as we also took a swing through the grounds of the Toyosato Elementary School, a school built out in the middle of nowhere by an eccentric Japanese businessman who as a child had to leave his hometown because it had no school. You cannot get there by any means but car. It’s worth taking something of a narrative detour here, for if this school looks familiar to you, you’re an anime fan. For those of you not screaming and clutching your Yui or Mio dolls, this is the school from K-ON!, an anime about a group of high school girls who form a pop band. The concept comes from a real life club (or bukatsu, 部活) that exists in some real high schools. It has been on my list of Things To Do In Japan for years, and because I did the mini-camper conversion, I was able to do it. Previously mentioned, one of the greatest aspects of flexibility when it comes to having a mini-camper specifically in Japan is that you can get almost all of your necessary amenities at one of the country’s insane Michi no Eki (道の駅) or “Road Stations.” Do not dare call these fine establishments for relaxation mere rest stops, you boorish plebeian. No, ma’am. These are essentially luxury shopping malls in the middle of nowhere if you take Japan’s fairly expensive, but not too expensive, tollway highway system. Japan is known for being clean. Really clean. But these places literally compete amongst themselves to be the most clean bathrooms anywhere in Japan. This one, Okasaki (岡崎), about halfway home between Kyoto and Tokyo was so confident it was the cleanest, it created an entire exhibition outside the bathrooms on how far they go to make sure the place is clean. You could even have your picture taken as a ninja version of the cleaning staff! In addition to going to the bathroom and buying your normal convenience store food, you can check on the traffic conditions throughout the tollway network. Very important when you are on a road trip across the country. Or buy specialty items from anywhere in Japan. Or buy people presents from the region surrounding the road station. And if you’re lost, or you’re overwhelmed, or need some help with your trip? They’ve got CONCIERGE SERVICE right there! In uniforms! And adorable hats! Now that’s Japanese travel hospitality. Everyone should try mini-camper travel at least at some point. It’s fun, it’s fairly easy, it allows for a lot of flexibility in time and destination, and it’s a great way to drive down costs for road trips. Had my passenger and I chosen to rent a camper, our costs would have gone up significantly. Had we chosen to use the bullet train system and stay in hotels, even business hotels which are the closest Japan has to motels, our costs would have been triple or more. We had a great time in our mini-camper version of the GA3, and you will have a great time, too. Don’t be scared to give it a go!